The youth group Partido Manggagawa-Kabataan (PMK) expressed concern at the lack of jobs awaiting the hundreds of thousands of new graduates this year. Tomorrow, PMK is holding a protest at the offices of the Department of Trade and Industry (DTI) and the Employers Confederation of the Philippines (ECOP) to highlight its call for decent jobs for young workers. “Are there enough jobs for 600,000 college graduates and thousands more of K-12 graduates immediately entering the labor force? Further, are there decent jobs awaiting them or just more of the usual endo work?,” asked Rea Foliente of PMK. PMK is the youth wing of the militant Partido Manggagawa. PM is among the labor groups active in the campaign to end contractualization and has criticized President Rodrigo Duterte for his refusal to sign an EO to make direct hiring the norm in employment relations. 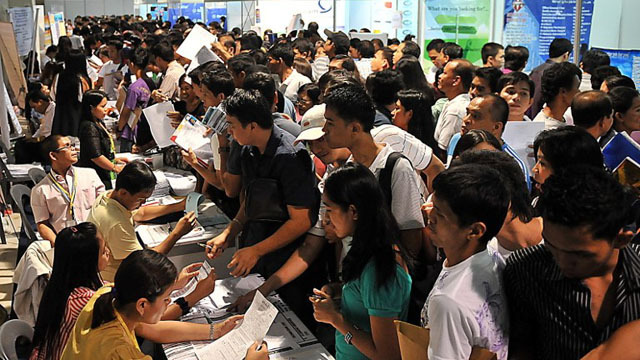 “Another employers organization, the Philippine Chamber of Commerce and Industry earlier questioned that the minimum number of hours required of senior high school students are not enough to train and qualify them for entry-level work,” Foliente explained. Some 100 PMK and women members of PM together with contingents from the Philippine Airlines Employees Association (PALEA) and Philip Morris Fortune Tobacco Labor Union will join the protest tomorrow against the DTI and ECOP for their pro-endo lobby and scare tactics against regular jobs. The rally comes after the announcement of Malacanang that President Duterte is not signing an EO to make direct hiring the norm in employment. Foliente cited the International Labour Organization (ILO) report titled “Global Employment Trends for Youth 2017: Paths to a better working future,” that stated that youth unemployment rate for Southeast Asia and the Pacific is seen to rise from 11.7 percent in 2016 to 12 percent in 2017, and to 12.2 percent in 2018.